Home Demolitions - Trump's EPA to ease up on asbestos regulation. Home demolitions are the experts in home and building demolition with professional processes and services at affordable rates in Sydney. The USA’s EPA has recently enacted the Significant New Use Rule. This rule allows the government to evaluate asbestos use on a case by case basis. Unfortunately however the new rule does not include the evaluation of exposure to asbestos in the air, ground or water. Asbestos has never been banned in the USA, however, it is tightly controlled. The use of friable (easily crumbled) fibres has been all but wiped out, but non-friable fibres remain in use to this day. home insulation and some potting soils. The asbestos in the products must account for less than 1 percent of the total product. Whilst these regulations have helped to reduce the risk of exposure by as much as 1000 percent, direct or indirect exposure to asbestos has been found to kill 40,000 Americans every year. Interestingly, President Trump has blamed the collapse of the World Trade Centre towers on the absence of asbestos on several occasions. This is despite the fact that asbestos, in the form of fireproofing, was present in 20 of the twin towers’ 110 stories. In fact as the towers imploded they released pulverised asbestos dust along with other toxic chemicals and asbestos alternatives throughout lower Manhattan. Asbestos Substitutes – Are They Any Safer? The fact that more asbestos alternatives were used in the twin towers than asbestos begs the question, are these substitutes any safer? Chrysotile substitutes comprise p-aramid, polyvinyl alcohol (PVA), cellulose, polyacrylonitrile, glass fibres, graphite, polytetrafluoroethylene, ceramic fibres and silicon carbide whiskers. There is not a lot of epidemiological research available concerning these substitutes. The groups studied have also faced far less exposure than the asbestos workers of old. On the surface it might appear that these substitutes are safer but much lower doses are used in todays experiments on synthetic fibres. As a result differences in the apparent risk levels cannot be taken at face value. There are now other deadly substances that are being identified and used in construction such as silica and carbon nanotubes. Research performed on mice at the University of Edinburgh has found that carbon nanotubes can cause similar damage to the lungs outer lining - also known as the mesothelium - as asbestos does. Immune cells clear out foreign objects in the lungs but straight fibres longer than 20 micro-metres such as carbon nanotubes cannot be removed in this manner. Affected cells become inflamed and create lumps called granulomas that go on to cause mesothelioma (cancer of the mesothelium). Silica has been touted as the ‘new asbestos’, it is now responsible for the most common occupation lung disease in the world, silicosis. It is caused by inhalation of crystalline silica dust. The dust causes inflammation and scarring in the form of nodular lesions in the upper lobes of the lungs. More research needs to be carried out on these asbestos substitutes and other materials. What It Means For Australia? Given Australia’s ban on asbestos, even considering that asbestos substitutes and other materials may not end up being any safer, it would be unthinkable for Australia to reintroduce asbestos in any way back into any industry after the fallout our country has experienced from it. Fortunately, the final decisions on building materials in the USA will rest with state governments, builders and architects who for the most part have good ethical standards and are environmentally conscious. Bart Simpson and Martin Prince are running for class presidet. Martin warns class there are to many parts of dangerous asbestos in the air. 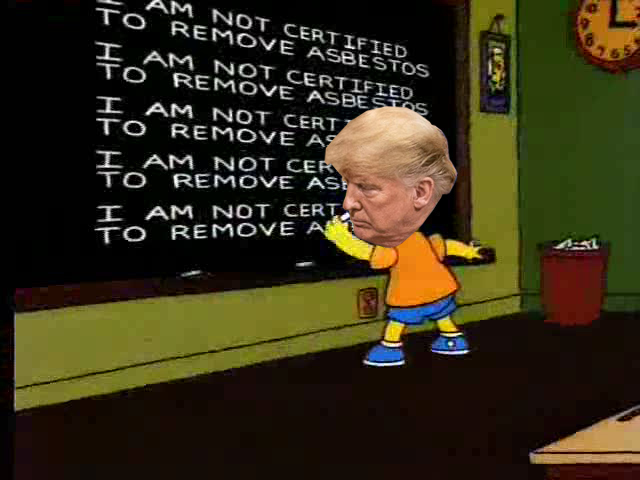 Bart opposes him and demands: "More asbestos!". The video was taken from The Simpsons S02E19 "Lisa's Substitute" (1991).